7 On The Park is the area’s first condominium – and an exciting opportunity to own in a neighbourhood on the move. The building is set apart by its unique architecture, which features a huge, stylized number 7 subtly incorporated into the façade, informing the shape of the building and dramatically setting it apart from surrounding structures. 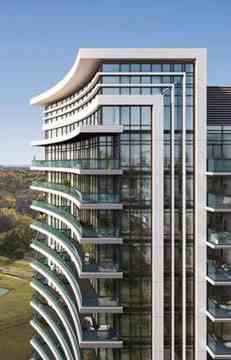 The modern point tower offers open-concept interiors with stunning city and park views. Get your heart pumping and build muscle in the fully-equipped fitness facility, with cardio machines, free weights, exercise mats and more. Relax in the lounge, which has plenty of comfy seating, a big TV and lots of space to kick back. But the best amenity is actually not even in the building – it’s right next door. Sprawling Amesbury Park is your giant front yard, with acres of green stretching as far as the eye can see. It is your place to play, exercise or just hang out. - TTC at Your Doorstep. 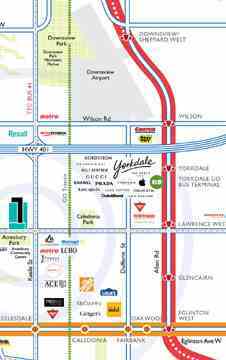 - Close to Yorkdale Mall (Only 7 minutes). - Access Hwy 400, Allan Road and Hwy 401 (3-6 minutes). - Go Train, TTC and UP Express (5-7 minutes). - Eglinton Crosstown LRT (Only 5 minutes). - York University (Only 12 minutes). 7 On The Park Condos is a condo development by iKORE Developments Ltd. at Lawrence Ave West, Toronto close to Keele St. There’s the TTC (bus and subway), GO Transit, the UP Express – and coming in the next few years, the Crosstown LRT and SmarTrack. Highways are easily accessible, too, with the 401 and the 404 only a couple of minutes away. Builders : iKORE Developments Ltd.
7 On The ParkBuilder(s): iKORE Developments Ltd.